You are currently browsing the archives for the Routing performance/quality category. What do you call a path alongside a road? It’s a key issue for us trying to produce intelligible itinerary listings — and even more important for our sat nav users where the names are called out! 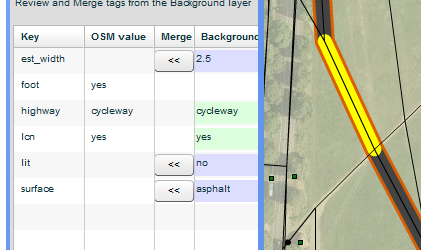 CycleStreets uses the street name if directly tagged in OpenStreetMap. If the name is not available any cycle route tagging from the way or any of it’s relations is checked. This results in names such as NCN51 or CS3. This has always been rather awkward and only slightly better than leaving them un-named. But when our sat nav apps call out such long conglomerations it sounds really painful — and something we just had to sort out! What’s a good name for the shared-use pavement cycleway between Fulbourn and Cherry Hinton? Cases where the joins at both ends are more complex are ignored. Some very useful cycle routes often run alongside roads, and are also often un-named in OpenStreetMap. We detect these cases by checking that the name of the nearest road at several points along the length of the cycleway. If the same name matches at least 70% of the length then the cycleway inherits the name of the road by being prefixed with ‘Alongside’. As an added bonus, we added a little easter egg relating to road names with ‘Drive’ in them. A good example of the alongside names are shown in this route and this one. The techniques above result in more sensible names for many tens of thousands of ways in the British Isles. We use some more techniques for fixing names across open spaces and inferring names of very short links between named ways. As a general principle we try to make best use of what data there already is in OSM rather than suggest new rules about how it should be used. But in doing this work we’ve noticed that some ways drawn in OSM carry on round the corner to run alongside differently named roads. Such cases won’t inherit the ‘Alongside …’ name because of the 70% quality threshold. To fix that those ways should be split at the corner. We did split the long cycleway between Cherry Hinton and Fulbourn at the point where the adjacent road changed its name. The second street named in this route shows that we’ve still got a way to go to cover more cases for choosing better names, but as ever this work is ongoing. How far would you ride to avoid a busy right turn? The graphic shows work in progress to improve the quality of CycleStreets routes by taking into account the cost of making a turn. 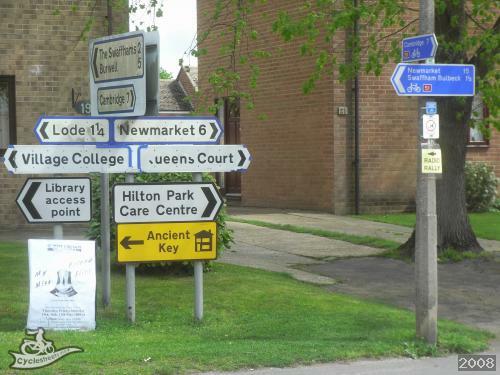 This is part of routing enhancement work being undertaken by Codex Cambridge with us as part of the Technology Strategy Board Innovation Vouchers scheme. Top: balanced route (amber) recommends turning right across busy Perne Road. Bottom: by including turn cost the advice changes to straight on at the roundabout. The upper frame shows three routes for a journey along Cherry Hinton Road, Cambridge from west to east. The quietest route in green avoids the busy roundabout by using the shared use footway and toucan crossing of Perne Road. The fastest route in red goes straight across the roundabout. The balanced route shown in amber takes the first roundabout exit and then uses the service road marked Adkin’s Corner to connect with the shared use pavement. The problem with the balanced route is that it is rather awkward to make that right turn off Perne Road. A rider willing to make such a right turn would likely be equally confident to have gone straight on at the roundabout. Turning right from a major road into a minor road usually requires looking behind and moving out into the road to get into the right position to make the turn. If there is a lot of traffic it may require stopping at an arms distance from the middle of the road and waiting until it is safe to complete the turn. These factors amount to an extra delay and make the route feel more busy. The lower frame shows the situation when the cost of making a turn has been included in planning the route and shows the balanced route going straight on at the roundabout. So for instance a right turn from a primary road into a service road could have a delay of eight seconds, whereas a left turn from a residential road to another residential road might have only a one second delay. Turn delays in seconds only affect the fastest routes, and have no affect on the quietest routes which are only concerned with how busy the route. To account for turns in quiet routes involves comparing a right turn with an equivalent cycling distance. Eg. are you prepared to cycle for an extra 100 metres to avoid a right turn off a busy road into a service road? Choosing the right numbers for that is a bit of an art and a lot of experimentation. This is work in progress, and there’s a bit more to do before we can include this in CycleStreets routes. CycleStreets has been using elevation data for several years to help avoid un-necessary hills in planned routes. The elevations we use are interpolated from open data surveys that provide an estimate of the height of the ground above sea level. The results of the processing can be seen in the elevation profile of every route planned on CycleStreets. But what about paths and roads that run inside tunnels through mountains or under rivers? The ground level estimation is not relevant to them. How is that handled? For straight tunnels through mountains the problem does not arise. The elevation profile for them is simply the height of the ground at each end of the tunnel, and appears like that in the route listing. For example this route through the Innocent railway tunnel in Edinburgh. But when a tunnel has intermediate points showing how it curves beneath the surface the problem does arise because the elevation calculated at those points is the level of the ground above the tunnel. Without fixing this, routes though mountain tunnels appear as arduous and as slow as going over the top of the mountain, and routes under rivers appear as flat as taking the ferry. Mountain tunnels are assumed to be as direct as possible between each end, so that the change in elevation along the length is a straight line, usually flat, (but can be sloping up or down). River tunnels are assumed to dip linearly in the middle to 20 metres below the lowest end. To determine which correction to apply, CycleStreets examines the flawed elevation profile. If it goes up between the ends it must be a mountain, if not, the river tunnel profile is assumed. The selected profile is used to correct the intermediate points and is completed before further processing builds the routing system. As the elevation data is accurate to only 100 metres these measures are only applied to tunnels longer than 200m. This example shows how CycleStreets has interpolated a smooth profile for a tunnel that passes under a ridge, as shown by the map on this route. This is an example of how CycleStreets estimates elevation through a river tunnel. These route options include a tunnel and a ferry route. Because tunnels are usually much shorter and faster than alternate routes these corrections to elevation inside tunnels are unlikely to make much difference to the choice of route offered by CycleStreets. But they do improve the accuracy of estimated journey times, calories counted and most obviously in the displayed route’s elevation profile. We’re pleased to announce a series of upgrades to the routing that have been rolled out in the last few months. We’ve extended the range of OpenStreetMap tags that the CycleStreets routing engine uses to find cycle routes. This has helped us improve the quality of the suggested bike routes in two main ways: by handling the surface descriptions of the ways and accounting for the time delay caused by various obstacles along a route, as well as some other enhancements. This is part of an overall project (to be fully launched very soon) to help merge in some great new data from the DfT [see our blog post about the testing phase which is now completed]. Based on the feedback we’ve seen recently these changes are already improving the quality of routes served to users, but as ever we continue to monitor, tune and enhance the various parameters. Surface quality has a major impact on the suitability of some routes for cycling. A few bridleways make excellent cycle tracks but the majority are usually deeply rutted a sometimes difficult even to push a bike when dismounted. Now that we are now doing more in our analysis of the tags to look at surface quality we’ve been able to significantly downgrade our default assumptions for the rideability of footpaths, tracks and bridleways. Only if they have tags that indicate good ride quality, such as tracktype=grade1 or surface=paved or surface=asphalt are they promoted to be considered cyclable as embedded in our routing sieve. We’ve introduced the concept of ‘hurdles’ to represent the various types of obstacle found on cycle routes. Originally the only types of hurdle we recognised were traffic lights at junctions or crossings. They introduced an average delay of 20 and 5 seconds into our route calculations. Following on from our collaboration with the Department for Transport and CycleCity Guides we’ve been able to extend the coverage to more types of hurdle such as bollards, chicanes, speed humps and stiles. In the routing system the hurdles add an average delay to routes and so routes with fewer hurdles are preferred. All the hurdles encountered are now included in the route listing pages, such as journey #2,163,046 which lists several cattle grids and a toucan crossing on just over a mile long route through Cambridge. We hope these changes will encourage more mappers to add more details to OSM. These will actively improve the quality of routing we can provide to users and ‘think like a cyclist’. Every cyclist can tell of a barrier that has caused them annoyance and delay, and adding the data to OSM will help them avoid that. A wealth of this data is now available as open data for you to merge in (manually) as this new screencast explains. A major new set of pages and an introductory blog post will follow on this shortly now that the data is available! Or via a way’s presence on a relation that has type=route,route=bicycle. Over the last year we’ve been pleased to work with Cycling Scotland on a range of projects, now all completed and outlined below. 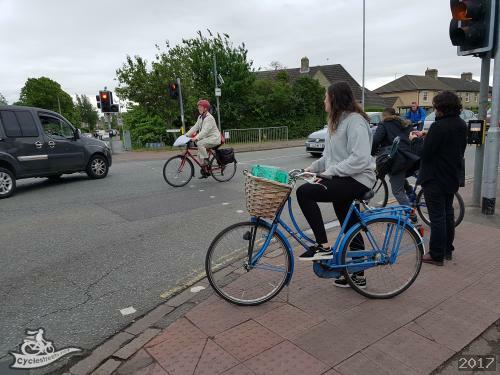 These projects, which have been achieved thanks to Cycling Scotland’s grant and funding of £22k, will help improve improve CycleStreets, to help people find their way and consider cycling as a practical option for their journeys. Cycling Scotland is the national cycle promotion organisation for Scotland, working to establish cycling as an acceptable, attractive and practical lifestyle option, and aiming to make Scotland a nation of cyclists. The new Scotland Cycle Journey Planner has launched! This is a customised, embedded site within Cycling Scotland’s website, enabling people to plan journeys from A-B directly within their site. It includes quick links to a number of cities in Scotland. We’ve created a community mapping guide, which explains how people can help improve the data used for the journey planner. This is part of Cycling Scotland’s ‘Community Cycle Mapping’ project which encourages local communities to capture cycling-related information so that it can improve the journeys of others. The guide is also available on Cycling Scotland’s website. Part of the grant from Cycling Scotland helped us to add support for more detailed information coming from in OpenStreetMap. By interpreting things like surface quality, various barriers, etc., we can improve the quality of journeys that we can suggest to users, leading to ever-improving routes. We also began work on supporting turn delays in the engine, to reduce the problem of wiggly routes in the journey planner engine. We hope to complete this in coming months. Finishing this will mean we can improve the practicability of routes that people follow. The CycleStreets Android app, available FREE was released last year more quickly as a result of the grant. The app is well-rated, at 4.3/5 with 99 reviews. Most reviews seem very positive and highlight how the app has helped them find better routes. The grant also enabled us to develop a new mobile small-screen version of our website. The site ensures that people can access the journey planner easily via their mobile, for a variety of types of mobile device. It has just been honoured as a winner of ‘Best Application Design‘ by the usability expert, Jakob Nielsen.